The following is a response to the post “What Students Really Need to Hear” from the talented Angela Millar, an 11th grade gem from Plainwell High School. It’s 2:46 a.m. I’m lying here in bed questioning why I’m still in high school. Why do I torture myself with the stress of a letter—a letter that can change my future for the rest of my life. A, B, C, D, F. Why do I go back day-after-day to be talked at by teachers, who despite having two ears and one mouth often speak more than they listen? First, you need to know that we do care. We do want to listen. We do want to succeed in your class. We do want you to know that each and every one of you have impacted our lives in some way. But, you also must realize that high school is one of the most stressful things we have yet to accomplish in our lives. And we are stressed. Really stressed. I’m so stressed that I can’t do my school work. I can’t talk about school without thinking about that one rotten, cringe-worthy word that keeps me up at all hours of the night: Grades. We aren’t average or below average if we fail a class or don’t turn in assignments. We are frustrated. We are infuriated. We are confused that every day when we get home after eight hours of sitting in odor-filled classrooms we are expected to do three more hours of homework. We do care. We care about if our siblings have food to eat when they get home from school. We care to know that even though our classmate’s dad is a drunk and their mom walked out on them that they are still loved—that everything is going to be okay. We care that our parents are proud. We care that when our father gets lung cancer and asks us to run the family business and take care of mom, we do so. We care about making extra lunches for the kids at school so that they can eat more than one meal a day. We care that when our school goes through tragic deaths—year after year after year—we can function each day with a smile on our faces even when we have scars on our hearts. We care about our families. We care about our classmates. And believe it or not we care about our teachers. You need to know that we are terrified. We have all told ourselves at some point in life that we can’t do it. We can’t grow up. 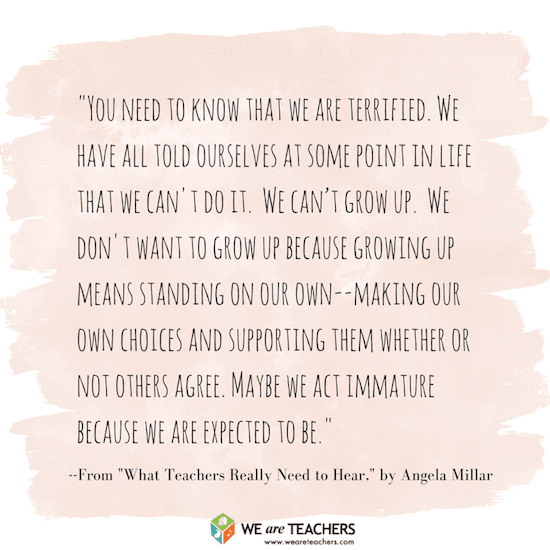 We don’t want to grow up because growing up means standing on our own—making our own choices and supporting them whether or not others agree. Maybe we act immature because we are expected to be. You need to know that we aren’t kids. We are young adults about to take on life. Real life. No one will be there to tuck us in at night, no one will be there when a light bulb needs to be replaced or when groceries need to be restocked. That’s all on us. And believe it or not in eighteen years it is still a struggle to find a calling in life: that one thing that can set us apart from the rest and set a path for a bright future. There are billions of jobs and within our four years in high school, you are suppose to help guide us into the right direction to the point when we are fully sure of who we are and who we want to become. Lastly, you need to know that we notice when teachers go out of their way to see how we are doing. Not just how we are doing academically but how we are doing in life beyond these walls. That is when an evaluator becomes a teacher: when you take a step out of your comfort zone to see if maybe—just maybe—the constant bruises on Phoebe’s face aren’t from being clumsy. That maybe Lydia doesn’t want to answer the question because her parents are going through a divorce or a friend has committed suicide. That maybe Jackson didn’t do his homework because he doesn’t understand it. He doesn’t understand because he didn’t pay attention. He didn’t pay attention because his mind is set that he is too stupid to do the homework, too behind to catch up, too much the “dumb kid” with no aspiration. He doesn’t believe he has the ability to achieve and that is why he has no life long goals. Because, no one taught him to believe in himself. No one told him that grades are just letters. You’re either the ignition or the brakes. You either spark a desire and inspire us to do better or stop us from believing we ever will. What you really need to know is that a teacher is meant to do exactly that: TEACH. Trust. Empathize. Accept. Care. Hope. And when a teacher really knows how to teach it creates this wonderful mix of present and future generations working together on improving a lifestyle, a study habit, a mind set. It gives us the power to choose what we want to do and where we want to be. It allows us to not only think on our own but to always know we have someone who wants us to be successful—someone to hold us accountable for those missing assignments and not let us fail classes. Not let us feel alone. Not let us feel like the world is just a heavy weight on our stressed shoulders. When you made the decision to teach, you didn’t do it to try to convince us that getting a letter or a test score is the most important thing in our lives. You chose to help educate and advise our lives. You chose to make a difference. So do what you set out to do in the first place. Because, no matter what you do, each year students will leave you and if you don’t feel like each and every one of those students is empowered to take on the world then you haven’t done your job. I am more than a letter. We are more than a letter. We are only in your classroom for a sliver of our lives. But when you teach—when you really teach —you are there forever. 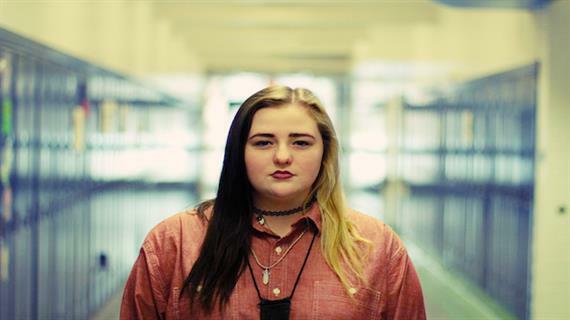 Angela Millar is a bold girl with a love for journalism and poetry. She has a knack for brightening the world with random acts of kindness and has a warm heart for everyone she meets. The world is lucky to have her — and she’s only getting started.